This past weekend, I was able to indulge in some necessary instructor continuing education by taking a FabPole Workshop with Lessi Ruskaup, owner of L'Ru Studios and creator of FabPole. FabPole is a program utilizing a Nexus Wrap sling system that allows attachment of silks to the pole or any other applicable aerial apparatus. 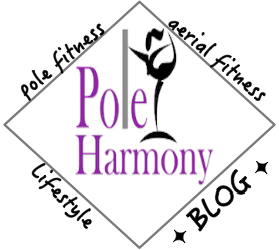 Currently at Pole Harmony, we have been using the Pole Aria metal attachment system of attaching our silks to our poles. With the Nexus Wrap, the attachment differs in that it is not a metal apparatus, rather a rubbery wrap that velcros to the pole and allows a sling to be attached securely over the wrap. Aside from the obvious product differences, the Nexus Wrap and sling attachment secures the fabric with a ring in place of the traditional rescue 8. The FabPole workshop I attended also used thinner fabric than I am accustomed to. When I first started working with aerial fabric, I used the thinner 60" fabric with my home rigging. Basically, 60" is defined as narrow when open, thin when gathered (Wikipedia: Aerial Silk.) The major notable comparison for the every day student is that 60" hurts more. The thicker fabric commonly used is between 104" to 109". Overall, I found the two hour workshop to touch base on intermediate to advanced level pole moves. I've had experience with using the pole and silks together without any prior instruction, therefore some of the basics I learned in the workshop we very useful. We performed some fairly involved moves on the fabric utilizing both the aerial knot and the free form of silks. The workshop really focused on using the silks in combination with pole work to it's fullest potential. I learned some new techniques that I can integrate into my existing curriculum with specific moves that I hadn't otherwise considered. I look forward to exploring more concepts with my existing device and discovering more uses for this tool in my lesson plans as my students progress. I really enjoyed the workshop and found I learned some valuable information that will assist me in my teaching.